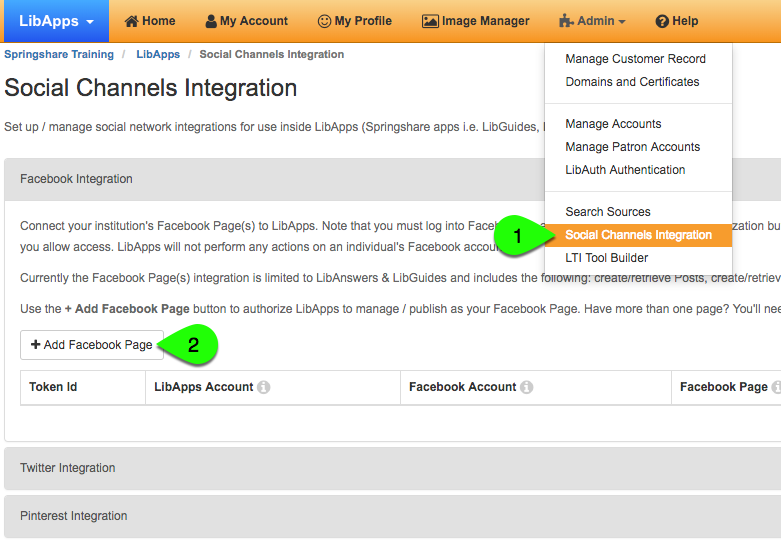 From the LibApps dashboard, go to Admin > Social Channels Integration. In the Facebook Integration box, click the Add Facebook Page button. Click the Login with Facebook! button on the next screen. You will then be taken to Facebook where you will log in (if you're not already) and choose what you allow LibApps to do. We ask to: Manage your Pages and Publish as your Pages. LibApps will not perform any actions on the individual's Facebook account, only on the Facebook Page(s) where you have allowed access. After logging into Facebook, choose the Facebook Page to connect to LibApps from the Facebook Pages dropdown. Click the Give LibApps access to Page button. Note: You can authorize multiple Facebook Pages for LibApps, but every Page authorization has to be done separately.